I know I am bordering on almost practically late, but before the deadline is totally upon me, let me quickly share my entry for this month’s Hay Hay it’s Donna Day. What with all the mousses and cheesecakes we blissfully devoured during the last two rounds, it was time for something lighter…like a salad. A Caesar Salad to be exact, decreed our lovely host for HHDD #12, Katie of Other People’s Food. Not to be limited with just a traditional Caesar, Katie encouraged us to bring her anything with “the main elements of Caesar”. And that is when all thoughts of “light” flew right out my window. 1/2 the quantity of the dressing found here. – Clean the potatoes and place them in a saucepan where they are completely submerged in water. Boil until just tender, then drain and let cool completely. – While the potatoes are boiling, make half the quantity of the dressing found here. – Fry bacon until crispy, drain on paper towels, then crumble. 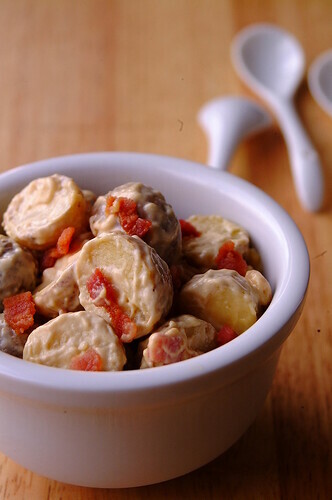 – Cut each potato in half, place in a bowl, and toss with the dressing and most of the crumbled bacon. – Save a little of the bacon bits to sprinkle on top before serving. – Serves 4-5 as a side. This is a great way to vary a regular potato salad. Donna’s Caesar dressing was excellent! I whipped it up with my immersion blender and I licked everything clean (not the blade part…please do not attempt). I will definitely make it for a proper Caesar salad soon…and more than once. Perhaps even as a condiment for sandwiches. We had some of this with the burgers I made for Paul’s Big Burger Ballyhoo.